Nothing could deter Lindsay Holy Family’s charge to a third consecutive Class D girls title in the Nebraska State Track & Field Championships at Omaha Burke Stadium May 20-21. The victory was especially sweet for the Bulldogs, led by Andrea Weeder’s four-gold performance, as they turned away fierce area rival Humphrey St. Francis for the third straight year by a margin of 72-58. Holy Family edged the Flyers by 4.5 points to start its streak in 2009 and outscored St. Francis 67-49 in 2010. It was far from a one-athlete show for the Lady ‘Dawgs. While Weeder was once again in the spotlight, Holy Family got point contributions from nearly every one of its state qualifiers to secure another trophy. The Bulldogs got off to a fast start and never let up on the Class D field. Ignoring a steady rain Friday afternoon, Holy Family’s 4×800 relay team of Breanna Korus, Melanie Fehringer, Melissa Schumacher and Weeder ran away from the competition to win in a season and News area best 9:44.742. 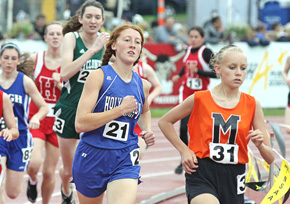 Later Friday, Weeder was even more dominant in her third straight 3200 meter state victory (11:14.402). She came back Saturday to add her first 800 state gold medal (2:19.731) and her third straight 1600 gold (5:20.348). All times were far and away season and area bests. That was the theme for the entire Holy Family team Saturday, as they dashed any hopes St. Francis or any other contender might have had. Senior Stacey Beller made a huge contribution with a runner-up finish in the 300 meter low hurdles (area best 47.105) and Korus placed 3rd in the 1600 (5:29.120) and 7th in the 800 (2:23.369).